These depend on the reaction between zinc and manganese dioxide (Zn/MnO2). A major difference that hugely reduces the leakage of cells is that the entire case is only a connection and the positive (On the other Zinc Batteries the case is negative and consumed!). It’s called “Alkaline” because because it has an alkaline electrolyte of potassium hydroxide, instead of the acidic ammonium chloride or zinc chloride electrolyte of the zinc batteries mentioned. So yes all three kinds of batteries have Manganese, Zinc and Chorides! This means there is some possibility of recharging an Alkaline cell if it’s charged slowly and not much more than 50% discharged. Claims are made of x5 life, but this is always compared to Zinc Carbon, not Zinc Chloride and also at highest current draw. At 125mA per D Cell or 50mA per AA cell, the extra capacity is closer to x2.4. At 10mA HT current the smaller Alkaline AA will exceed the life of the larger Zinc Carbon “B” cell. So while the Alkaline isn’t as good as claimed except where drain is so high an NiMH (Nickel Metal Hydride) rechargeable is better as long as no more than x2 cost it’s a better solution. Ironically though Eveready developed the Alkaline Cell, they and UK Ever Ready thought it too expensive. Mallory licensed it marketing it so successfully as Duracell that belatedly Eveready launched it as Energiser. UK Ever Ready sold it as Ever Ready Gold and South African Eveready as Platinum. Later Mallory changed the Company name to Duracall and when Eveready was purchased by Purina (the Pet Food company) after the NCC and Union Carbide Eras they created Energiser Holdings to own Eveready and other companies. 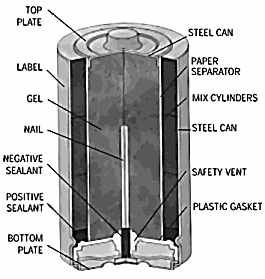 While the basic Zinc cell will invariably leak if completely discharged as the case is consumed the case of an Alkaline cell isn’t consumed (it may be steel). Energiser, Duracell and Rayovac/Varta have at times offered a replace equipment deal if the cell leaks. Generally it only leaks if faulty / poorly made or the pressure on bottom negative disk is too high. As the case is positive care must be taken to not damage label in “earthed” metal holders that were designed for regular negative case Zinc cells.